Blade length : 53.8 m or 21.2 inches. Shape : Wide and thick blade with a little bit deep Sori, long Kissaki. 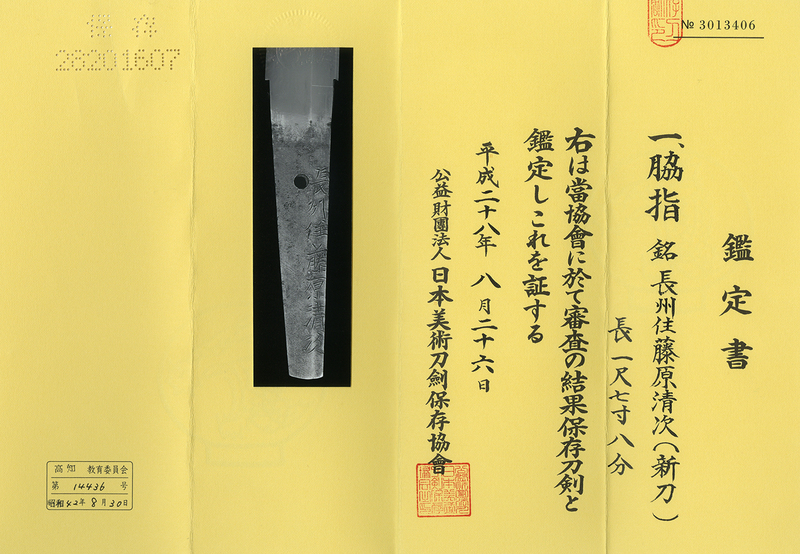 Jigane : Koitame-hada well grained, Jinie attached. clean and beautiful Jigane. Hamon : Niedeki, Gunome-midare, long Ashi work, Sunagashira work in Ha. Special Feature : Choshu Ju Fujiwara Kiyotsugu was a student of Kyo Iga no Kami Kinmichi, he wrote the signature as Nio Kiyotsugu as well. At this period, it might be the hardest time for swordsmiths to make a living. Despite such an adversity Kiyotsugu made this nice Wakizashi. it looks reminds me of the works by Tadatsuna. I can say this is one of his best works.